The Salsa Festival on March 19 will include food, entertainment and Maricopa Science City. Salsa meets science again this month in Maricopa. The 12th annual Maricopa Salsa Festival is March 19, 2-8 p.m., at Copper Sky Regional Park. As always, expect a diverse array of salsas to taste and entertainment all day. Maricopa Science City will have a display of how science impacts modern lives, and watch out for the Rattlers. Judging of the salsas will be a little different this year, Special Events Manager Niesha Whitman said. The city will have a new mobile app allowing salsa fans to register their votes electronically. Organizers also want to re-work the weight of the judging. Instead of the “celebrity judges” determining the top prize, that Best Overall $1,000 reward probably will be determined by the “People’s Choice” vote. Category winners will get $500, and the judges’ prize winner will get $250. The Little Pepper Zone will have kids’ activities, and adults can imbibe in the beer garden. There will also be a food and vendor village. Consumption of beer will no longer be confined to the Beer Garden. The entertainment begins at 2 p.m. with a full variety of performances. Copper Sky instructors will lead Zumba and Salsa dance lessons. Fiesta Mexican performs twice, bookending Danzarte Danza Folklorica. Maricopa’s Laura Walsh will headline the entertainment. She takes the stage at 7 p.m.
Maricopa Science City will be set up at the north entrance with its exhibits by local professionals showing the fun side of science. See nitrogen-frozen ice cream, the science of baseball, the science of color, new police technology and much more. This year, Science City includes a science fair. Students attending elementary, middle school or high school are invited to register their science projects and compete for scholarship money and a trophy. Check out robots and other student engineering feats. Arizona’s own Arena Football team, the Rattlers, will conduct a public scrimmage at 12:30 p.m. and lasting into the early part of the festival. This year, the team is having its training camp at Copper Sky. 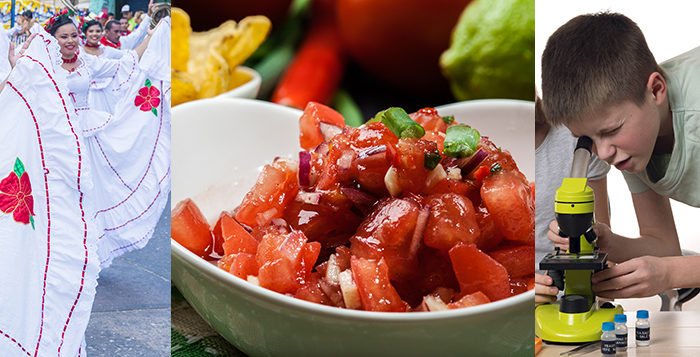 Admission to the Salsa Festival is free. There is a $5 charge for the Little Pepper Zone. Salsa voting packets are $1 each. Parking at Copper Sky is $5 and free for vehicles with ADA hangtags or plates. The city is again providing shuttles on a continuous loop to free parking at Santa Rosa Elementary School, Santa Cruz Elementary School, Maricopa Wells Middle School, Maricopa Elementary School, Saddleback Elementary School, Butterfield Elementary School and ACE Hardware (ADA access).